A lot of farmers will tell you that the food grown through sustainable agriculture is only part of the equation. Creating infrastructure for small growers through food hubs, incorporating marketing and educational materials for customers and overhauling the perception of organic food in the United States are all essential parts of a successful food evolution. Indeed, there’s more to food hubs than just food. Just ask Kristen Suokko of Local Food Hub in Charlottesville, VA.
“We see Local Food Hubs nationally having impacts on a range of interrelated issues: food security, food safety (knowing where the food comes from), local economic vitality, land stewardship, and public health,” shares Suokko. Originally from New England, Kristen Suokko is a big believer in the world of sustainable agriculture and protecting the environment. After graduating from Middlebury College, Suokko went to Washington D.C. to work for the Natural Resources Defense Council and the US Department of Energy. “My time in Washington gave me experience dealing with the kinds of interrelated issues and stakeholders that make up a system as complex as the food system, helped me make the connections between national policy and local impact, and honed my skills in diplomacy, writing, and speaking,” explains Suokko. Suokko came to Virginia to work in environmental philanthropy and after a few years sharing her time with several foundation and nonprofit boards, she became the executive director of Local Food Hub, which is comprised of a farm located near Scottsville, VA, a food warehouse in Ivy, VA and an office in downtown Charlottesville, VA.
For many small growers, the wholesale market is one of the hardest nuts to crack due to licensing issues, volume demands, insurance needs and contacts in the supplier’s business network. Through Local Food Hub, the farmers are able to bring the amount of produce they have under their established growing requirements and sell to the wholesale market through the hub’s aggregate system. 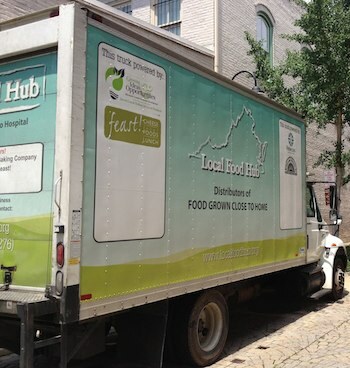 Over 70 of Virginia’s small growers take their food to Local Food Hub’s distribution center for resale. Local Food Hub staff sort, pack and deliver the produce to schools, restaurants, hospitals and stores. Buyers that use Local Food Hub benefit from their choice as they can promote their support of the local food movement and thus the local economy. With Local Food Hub acting as the nonprofit middle man of the chain, it’s a win win for producer and consumer. Like all organizations, funding is essential to Local Food Hub’s continued success and future expansion. The main cost of the food hub is the current need to establish infrastructure. Warehouses, refrigerated trucks and food service equipment costs money. With total annual expenses somewhere around the $300,000 level, the support of the community in kind and in monetary contributions is essential. Funded through a combination of grants, family foundations, individual donors and earned income, Local Food Hub is hoping to reach a level of self-sustainment in a few years. Since it began in 2009, Local Food Hub has worked with over 150 wholesale customers, putting nearly two million dollars into the local food system. They deliver food daily to area hospitals, schools, restaurants, nonprofit and for profit companies paying the farmers a competitive price for their produce. Local Food Hub isn’t just about creating viable infrastructure for sustainable agriculture, however. Educating farmers and buyers alike is an integral part of their organizational mission. Farmers that sell their produce through Local Food Hub have access to their Grower Services program. The free program includes annual seminars on the latest issues in sustainable farming and how to grow a small business. Farms are given help with creating business and marketing plans, streamlining and extending production, determining price points and even what to grow. “While we don’t require our farms to be organically certified, we do require certain tests (such as water tests), encourage sustainable practices, and offer workshops and technical assistance for adopting such practices,” explains Suokko. A seven acre test farm operated by Local Food Hub acts as a place to experiment with growing techniques which are then shared with the network of farmers. Local Food Hub staff visit the farmers at work to establish close personal relationships and offer assistance and advice whenever possible. Wholesale buyers and the institutions they work with also benefit from the Local Food Hub’s holistic approach to sustainable agriculture infrastructure. Outreach includes education packets to cafeteria and kitchen staff, assistance with menu planning and local food promotion. Information is provided to aid institutional buyers in educating their customers or students in better food choices and providing information on food origination. Local Food Hub holds the insurance policy wholesalers need to work with smaller farms and keeps clear records of food origins and handling records. This provides the larger buyer with the assurance that comes with traditional wholesale buying. For those folks who can’t afford to purchase fresh local food due to financial difficulties they still have access. Local Food Hub donates a quarter of the food grown on their test farm to area food banks. The farm is managed through a partnership with the International Rescue Committee. This organization focuses on finding steady, safe paying work for new refugees. Refugees work the Local Food Hub farm under the supervision of an experienced farmer providing them with skills they can use on other regional farms. Other programs of Local Food Hub include a farm to school outreach program and a partnership with the Virginia Boys and Girls Club to create pop up farmer’s market events around the city to ensure all residents have the opportunity to purchase fresh and buy local. Acting as the mediator of the local food movement is hard work. “Really know your market (supply and demand) and have a business plan,” advises Suokko. “Be acutely aware of infrastructure needs, and don’t underestimate the need for public outreach and education in the early stages.” The staff and volunteers of Charlotteville’s Local Food Hub have created a viable option for the areas larger institutions to incorporate the local food system into their offerings and at the same time provided area farmers with security and essential advice for sustaining the slow food movement in their region. Local Food Hub considers itself a start up in the local food movement. Recently, the Wallace Center at Winrock International chose the Charlottesville organization as a “study hub” as part of its research into the sustainable food system in America.